A joint task force has been formed to try to strengthen the Georgia Board of Accountancy at a time when the state is looking for ways to bring more state agencies under an umbrella organization. A task force of the Georgia Society of CPAs is working in conjunction with Secretary of State Brian Kemp, NASBA and the AICPA to find a way to resolve the situation. Although Senate Bill 445, that would have brought the Accountancy Board under a “Consumer Board” of non-CPAs, was withdrawn in February by Mr. Kemp, who had proposed it, the threat continues (see sbr 4/12). 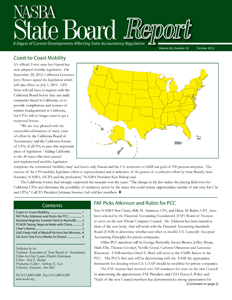 As reported in the September/October 2012 issue of the GSCPA’s Current Accounts, the average net revenue for the Georgia Board is over $637,000 a year, as generated by license fees and fines. These funds go into the General Fund of the State of Georgia, and the Board is then appropriated an amount, which has been a little under $230,000 per year. Supporters of the Accountancy Board have been citing the white paper prepared by NASBA’s Committee on State Board Relevance and Effectiveness, which stressed the need for a Board to have staff with professional knowledge. NASBA’s Director of Government and Legislative Relations, John Johnson, has been working with the Georgia Board. At NASBA’s 2012 Annual Meeting, Mr. Johnson will moderate a panel including Georgia Board Member Wanda W. Goodson, CPA, who will discuss the current situation in her state.